Brand: CK Products 76-121 Units: 1 gal. 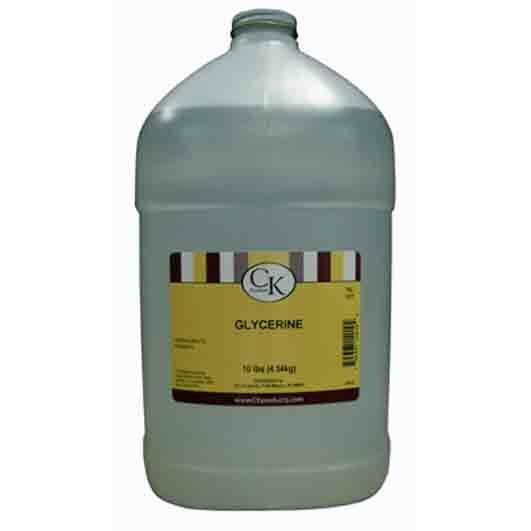 jug Glycerine is an ingredient used in rolled fondant and gluten-free recipes. It helps to improve the texture and keep food items soft. Glycerine adds sweetness, softens icing, and can preserve fruit. This is a vegetable based glycerine. Glycerine is an ingredient used in rolled fondant and gluten-free recipes. It helps to improve the texture and keep food items soft. Glycerine adds sweetness, softens icing, and can preserve fruit. This is a vegetable based glycerine. This product is prepared and packaged using machines that may come into contact with Wheat/Gluten, Eggs, Dairy or Dairy Products, Peanuts, Tree Nuts and Soy.